BEIJING (Xinhua) – Masimov and Chinese Premier Li Keqiang oversaw the signing of 33 deals worth a whopping $23.6 bln. According to Xinhua, the deals include projects in the “steel, non-ferrous metals, sheet glass, oil refining, hydropower and automobile” industries. Li praised the deals as a sign of the complementary nature of the Chinese and Kazakh economies. Chinese President Xi Jinping (R) meets with Kazakh Prime Minister Karim Masimov at the Great Hall of the People in Beijing, capital of China, March 27, 2015. As guest of Chinese Premier Li Keqiang, Masimov is paying a working visit to China this week and will attend the annual Boao Forum for Asia conference, which will be held from Thursday to Sunday in south China’s Hainan Province. Chinese President Xi Jinping met with Kazakh Prime Minister Karim Masimov on Friday, calling for enhanced cooperation through the joint construction of the Silk Road Economic Belt. Xi called on the two countries to strengthen cooperation on key projects, the transfer of manufacturing capacity, finance, the Silk Road Economic Belt initiative and Kazakhstan’s Bright Road initiative. Kazakhstan’s Bright Road initiative is aimed at revitalizing the country’s economy while jointly promoting infrastructure construction cooperation, such as developing steel works, power plants and building railroads. Kazakhstan hopes to beef up cooperation with China through the platform of the Asian Infrastructure Investment Bank and the Silk Road Fund. 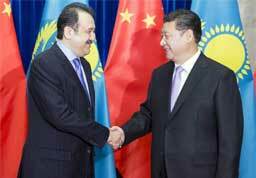 China-Kazakhstan economic cooperation is not limited to infrastructure projects. Chinese companies are pushnig to become the driving force in Kazakhstan’s industrialization; Beijing is encouraging Chinese firms (particularly those based in neighbouring Xinjiang) to invest in Kazakhstan. Meanwhile, Kazakhstan’s government also plans to dedicate $477 mln to joint projects with China, particularly the trans-border free trade zone centred on Xinjiang’s Khorgos city.